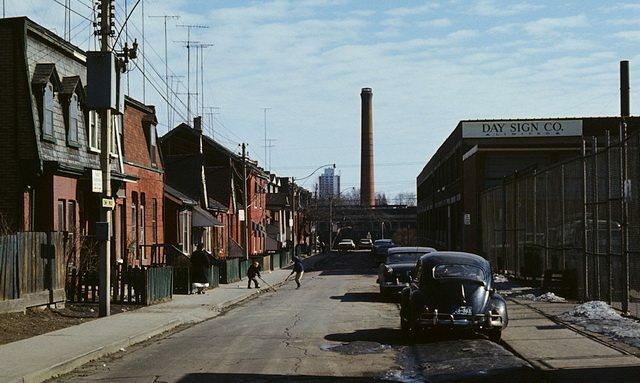 A run-down residential street, adjacent to light industrial, in the East End of Toronto, ca. 1970. Photo by Robert and Harold Stacey. From the City of Toronto Archives, Fonds 2, Series 8, Subseries 4, File 5. Toronto today enjoys a reputation as a liveable, functioning city. Among the mix of various social and economic factors that inform such assessments is the perception of Toronto as well-planned with a vibrant live-work downtown core, reasonably high-density inner suburbs, an extensive parks system, and a mix of roadways and transit. Such valued characteristics, however, emerged from two antithetical planning regimes: “a top-down and metropolitanist” approach in the 1950s and 1960s, and a “predominantly bottom-up and localist” program from the 1970s. 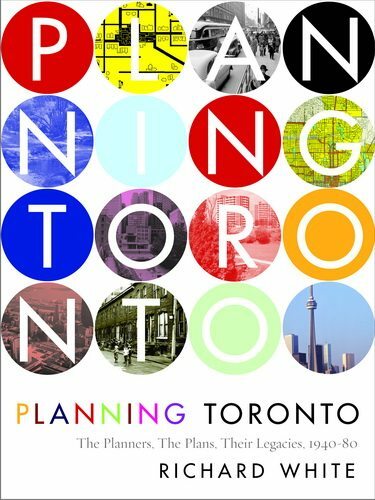 “Can two contradictory programs create one good reputation?” Richard White asks in Planning Toronto: The Planners, The Plans, Their Legacies, 1940-80 (UBC Press, 2016), which is being released today. The University of Toronto Mississauga historian’s exhaustive account spans from the 1940s, when Torontonians embraced government-led solutions for servicing a rapidly urbanizing country, to 1980, by which time citizens were firmly entrenched at the centre of the planning process. Balancing academic rigour with readability, Planning Toronto is the definitive history of Toronto area urban planning. Teasing out remarkable nuance in some well-known events, White also pushes readers to reconsider what they already know—or don’t—about the city’s urban development in those decades. 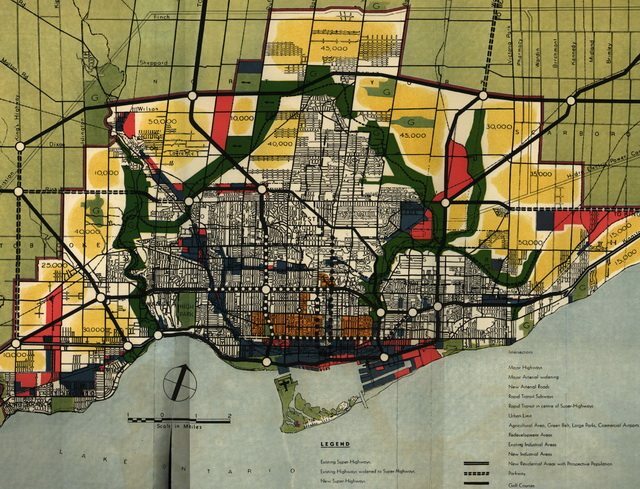 White’s close analysis of individual plans—regional, city, or neighbourhood in scale—that have shaped the GTA (as well as those which were still-born or have been largely forgotten), is augmented by extended discussion of the planners themselves. Those he discusses, like E.G. Faludi, who advised municipal governments in the 1940s and designed neighbourhoods for private developers in the 1950s, or Howard Cohen, who started off leading community consultations in Trefann Court in the early 1970s, and emerged as the “standard-bearer for citizen engagement and neighbourhood resistance” within the Toronto bureaucracy, have rarely received such biographical treatment. White uses their stories, and those of other planners, to illustrate how their education, personal backgrounds—and even whether they lived in Rosedale, Don Mills, or the gentrifying downtown core—shaped their proposals and plans. The result is that, far from being an impersonal recitation of the contents of government committee reports and planning studies, Planning Toronto explores the ideas and international trends that informed Toronto-area initiatives, as well as the external factors—like petty politics, availability of funding, interpersonal dynamics within planning departments, or intense development pressure—that influenced their success or failure. White’s account reveals again and again how planning is the easy part; the politics required to put vision into practice—and to pay for it—are much harder. Map of the 1943 Master Plan, showing strict demarcation of urban-rural, projected populations, rough concepts for an super-highway system, rapid transit line, and inner greenbelt parkland. Original from the Royal Architectural Institute of Canada, via UBC Press’ online supplements to Planning Toronto. Perhaps most surprising is the degree to which the Toronto area’s planning has been shaped by small-c conservatism. The earliest example was the fate of the 1943 Master Plan. Devised by a panel of external experts retained by the city’s planning board, it presented an ambitious vision of raze-and-rebuild modernism. But even as Torontonians eagerly flocked to tour public displays at Simpsons department store highlighting the plan’s concepts for high-rises and expressways, the scheme was already being kiboshed in the council chamber. And when city staff, led by Tracy D. leMay, a surveyor with no expertise in or inclination towards international trends in town planning, finalized the city’s Official Plan in 1949, the document merely compiled long-standing staff recommendations without adding “a single original idea.” Its creators, White argues, didn’t want the new plan to “fall into the [same] trap of being idealistic and impractical”. The brand of modernist planning that was finally introduced here by Matthew Lawson, leMay’s successor and an internationally-educated professional planner, was a conservative, “cautious modernism,” which was pragmatically adapted to local circumstance and incorporated the lessons learned from its unadulterated application elsewhere. Even the reformers who rose in prominence in the late 1960s were motivated by a degree of conservatism, White shows. Whether as community activists, municipal politicians, or staff of the city’s planning department, they believed in retaining the existing urban fabric. The fact that Toronto was long “a strikingly old-fashioned place for a city of its size and significance,” White persuasively argues, repeatedly saved the city from modernism’s worst excesses. White shows remarkable ability to get into the mindset of other eras to examine the circumstances to which planners were responding and from which decisions emerged. Whether it’s in the years of studies of social and economic trends that informed Metro Toronto’s far-reaching 1959 Plan, or in the construction of the Spadina Expressway impacting several thousand householders to ease traffic congestion for several hundred thousand more, the modernist planners operated with fairly pragmatic logic. Seeing things from their point of view allows White to revisit some of the city’s famous battles between technocratic planners and the public—the Spadina Expressway foremost among them—with a careful rendering of historical context, but none of the usual triumphalism of hindsight. 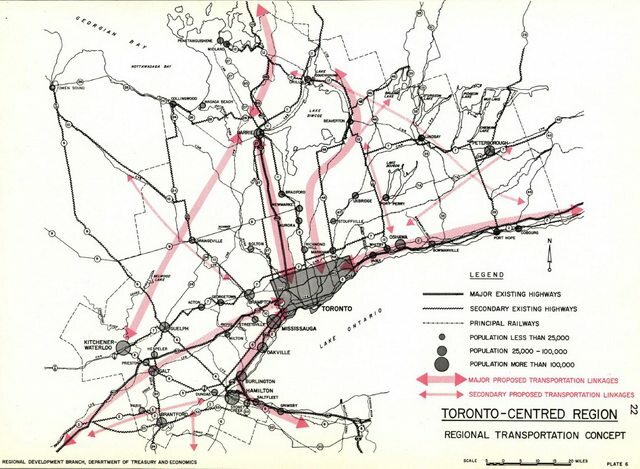 Map showing conceptual transportation linkages in the provincial government’s failed Toronto-Centred Region scheme (1970). Via UBC Press’ online supplements to Planning Toronto. This isn’t to say White thinks Spadina ought to have been built or that he’s nostalgic for modernism’s unfulfilled potential, rightly noting that the planners researched the facts of populations impacted by plans, but rarely considered their thoughts. White states flatly that grassroots activism against planning initiatives has been beneficial to Toronto. But it’s one of a number of instances where, with the benefit of placing things in a 40-year historical context, White explodes myths or forces the reader to reconsider familiar narratives. He similarly downplays the importance opposition to urban renewal projects in Don Vale, Trefann Court, and elsewhere played in swinging broad public opinion towards reform politics in the late 1960s and early 1970s. He emphasizes instead the unpopularity of apartment high-rises, which were being built everywhere by private developers empowered by outdated zoning laws, and which directly impacted a far greater range of residents and neighbourhoods than the relatively small pockets of renewal. The approach taken to revise the disruptive Trefann Court renewal scheme did, however, represent the moment when the planning process shifted “from what the planners wanted into what the affected public wanted.” What was lost with the rise of this citizen-centered planning paradigm, White goes on to examine, was metropolitan or regional coordination on projects with broad public benefit. 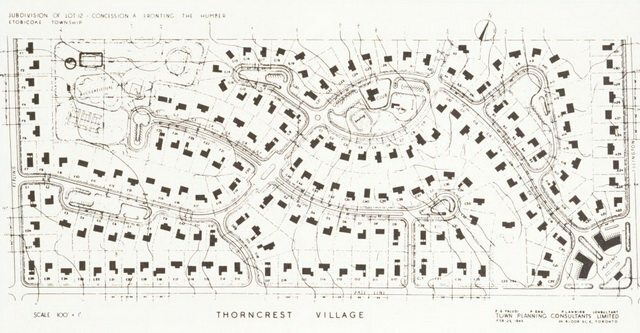 Plan of Thorncrest Village. From the City of Toronto Archives, Fonds 200, Series 1465, File 115, Item 15. White’s focus on municipal-level planning is limited to the City of Toronto itself, save for brief forays into Etobicoke’s earnest planning efforts or Scarborough’s stubborn determination not to plan. Suburban growth is mostly discussed in reference to particular best-case scenarios like Thorncrest Village or Don Mills, or in the abstract in province-led plans. It would be great to have more direct examination of how seemingly sound principles of early developments devolved into unbridled suburban sprawl. And one wishes Planning Toronto continued beyond 1980 to revisit, for example, some of the questions he raised for the Neptis Foundation about the province’s ambitious Growth Plan for the Greater Golden Horseshoe (2006) nearly a decade ago. Yet, it’s perhaps unfair to criticize an already-lengthy book for not including more discussion of this plan or that event. It’s simply that one wants more of White’s thorough and thoughtful analysis applied to more contemporary topics. White’s insistence on calling his interview subjects “participants” is one of a few turns of phrase that remind the reader that Planning Toronto emerges from an academic milieu. That his interviews included some of the foremost political leaders and professional planners of the day makes it unfortunate White doesn’t give more on the behind-the-scenes machinations in planning offices and the council chamber. But when White quotes his interviews in the texts, the speaker is almost always anonymous. As detailed as his research is—mined from the plans themselves, meeting minutes, even real estate brochures—White illustrates where gaps in our knowledge remain, whether it’s the relative scarcity of records from private developers or limited access to municipal records at the Toronto city archives. It’s often impossible to know, he acknowledges, who in a committee pushed for the inclusion of particular idea in a plan, the full story on some private developments like Lawrence Manor, or some individuals’ unspoken motives. The result is that White seems tentative about making firm statements in some instances—though not with his larger, over-arching conclusions—even when the evidence appears strong enough to do so. The text is supplemented by a copious number of streetscape photos, aerial views, as well as maps and illustrations drawn from the various plans themselves and private development proposals. Some maps, their original colour demarcations turned to nearly indistinguishable hues of grey, don’t transfer crisply to the black-and-white book page. But the worst offenders are among the more than 20 images UBC Press has made available online in high-resolution and full-colour. The cover price—$50.00—suggests the expectation of a limited, academically-minded audience. But Planning Toronto deserves a broad audience, whether readers find it in the bookstore or the public library—which has 15 copies on order. In a readable, comprehensive account, White adds depth and nuance to sometimes well-known events in postwar Toronto history, encouraging readers to reconsider common assumptions.